After our morning pick-up at Heathrow Airport, we make our way south-west towards Devon and Cornwall, stopping en-route for lunch (included). 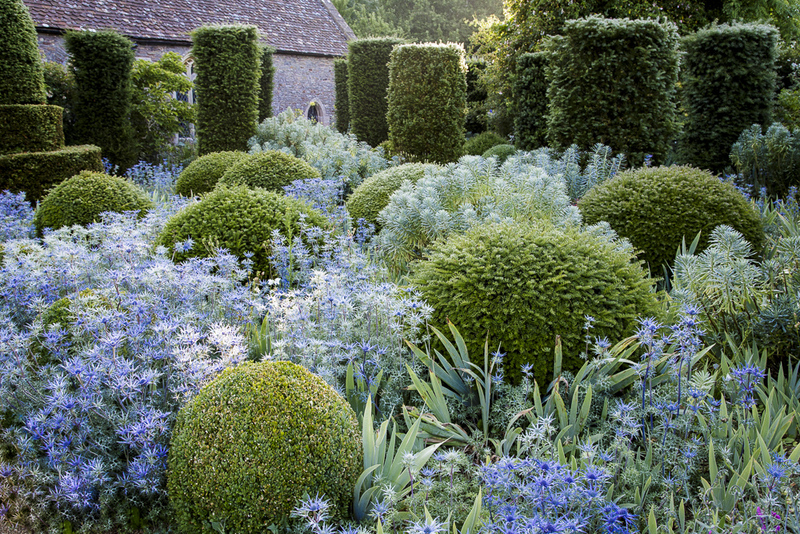 We visit Hanham Court, a privately owned house with award-winning gardens designed by Julian and Isabel Bannerman. We arrive, late afternoon, at our hotel – the beautifully situated 4-star Carbis Bay Hotel & Spa, St Ives. This stunning coastal retreat, located close to St Ives, has its own 25 acre beach and breathtaking views. Join your tour director and the rest of the group for dinner (included). Today we make an early start. 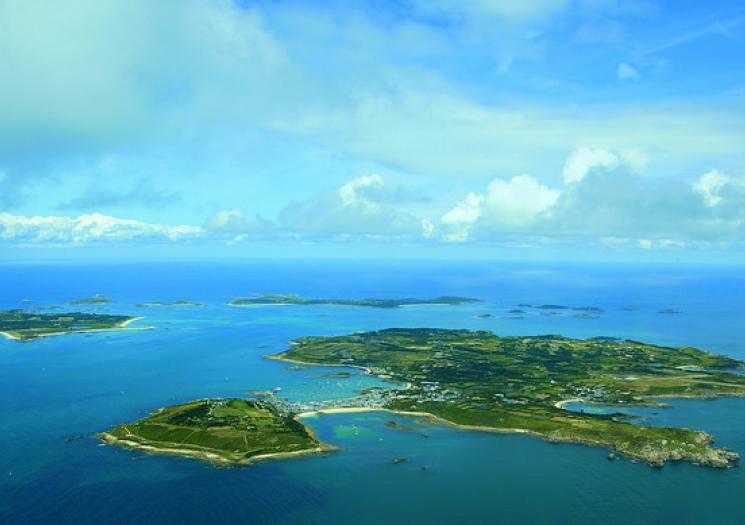 We take a flight from Land’s End airport to the Isles of Scilly, nestling just 35 miles off the coast of Cornwall, these islands are like nowhere else in England. Outstandingly beautiful, uncrowded and unspoilt, they seem like a world apart from everyday life. 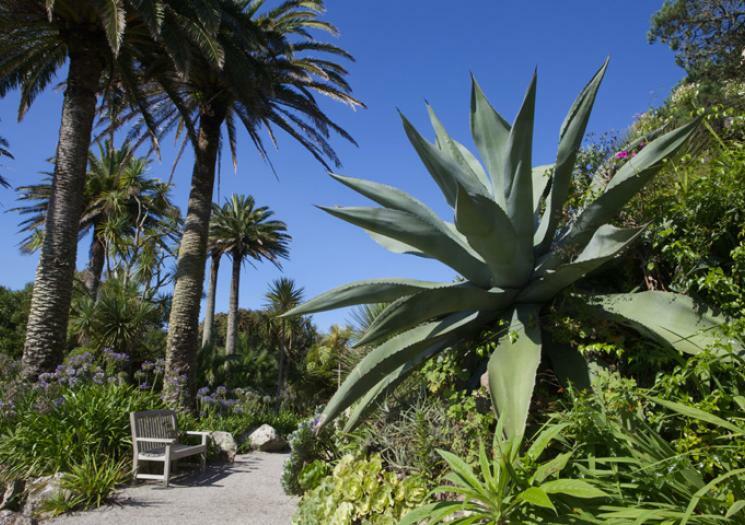 We take an inter-island boat to the island of Tresco to visit the Tresco Abbey Gardens. This tropical garden is home to species from 80 countries, ranging from Brazil to New Zealand and Burma to South Africa – the diversity of plant life to be found within the Abbey Garden is extraordinary. There will be time for lunch (independent) at the garden before enjoying some of the island scenery and the return flight to the mainland. Dinner in the hotel (included). Please note: This day trip to the Isles of Scilly includes transport by small aircraft (8-15 seats) and by small inter-island boat. If you prefer not to join the tour this day, please let us know at the time of booking and we may be able to adjust your tour price. 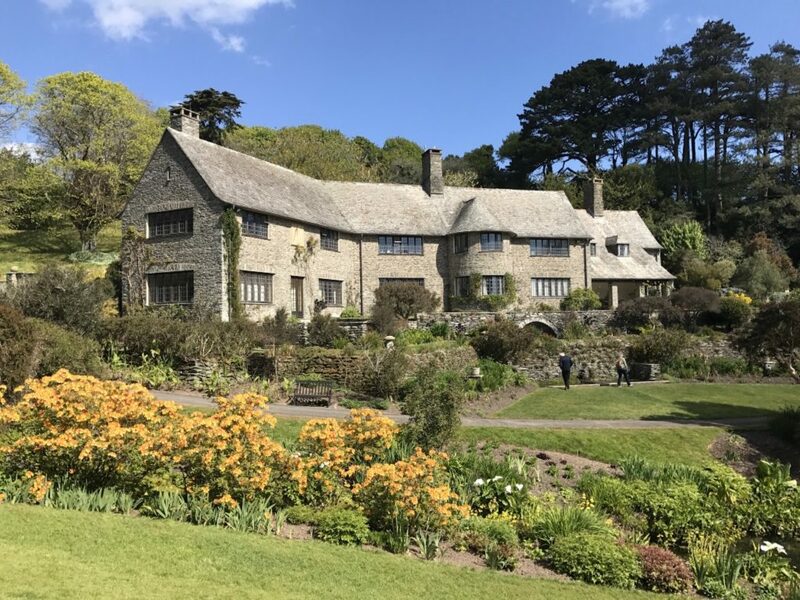 Our first visit of the day is to Trebah Garden, for an introductory talk and time at leisure to stroll through the gardens. 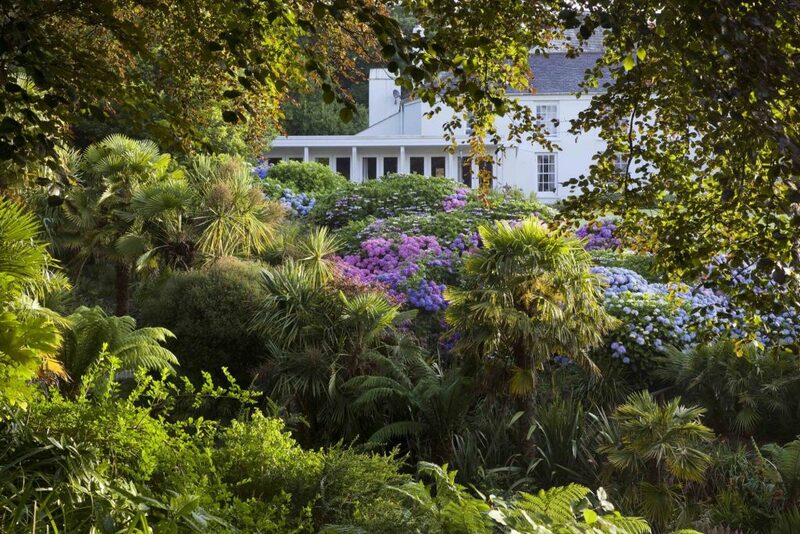 Trebah Garden is a wooded 25 acre sub-tropical ravine garden that descends to its own beach on the beautiful Helford River. It is the result of 160 years of inspired and dedicated creation. The natural spring at the top of the garden drops 10ft into the Koi Pool and cascades through drifts of brightly coloured waterside plantings. 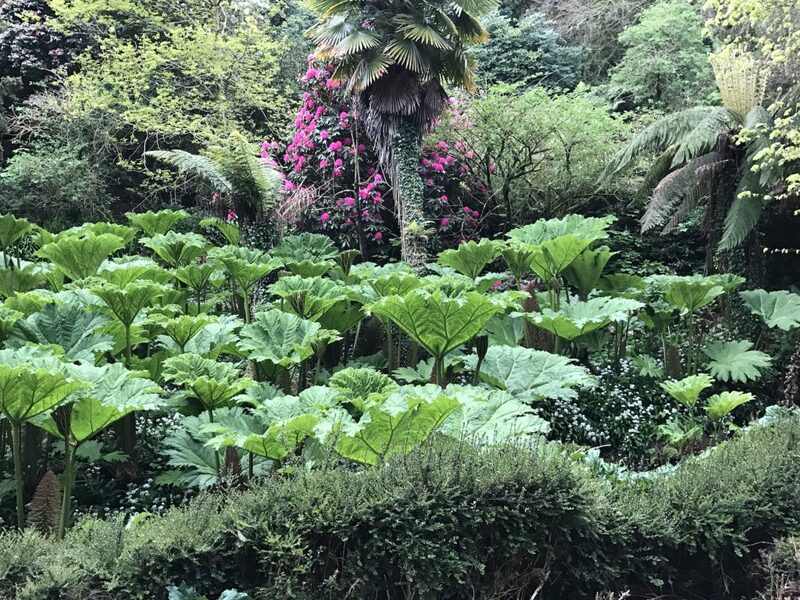 In the afternoon we continue onto the adjacent Glendurgan Garden – a valley garden of great beauty, created in the 1820s and running down to the tiny village of Durgan and its beach. 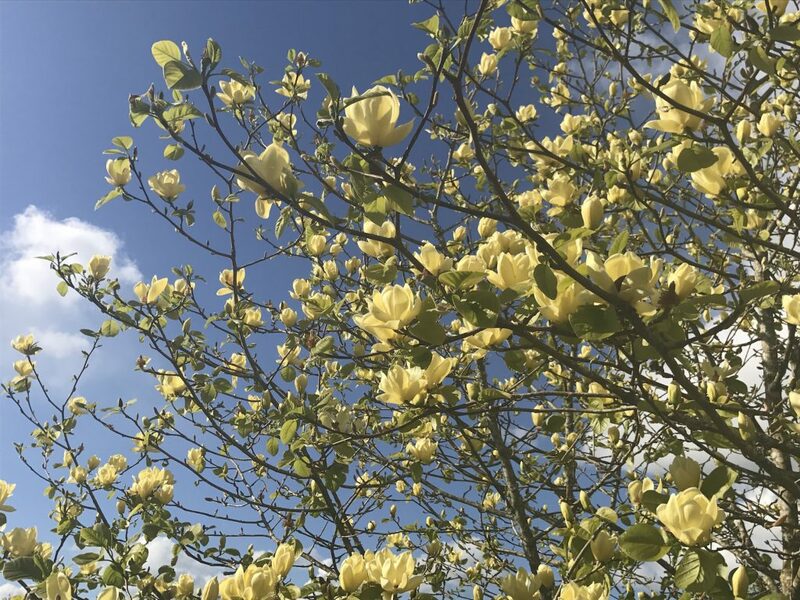 There are many fine trees and rare and exotic plants with outstanding spring displays of magnolias and rhododendrons. Here we enjoy a private lunch (included) and a gardens tour. We return to the hotel where your evening is at leisure. Today we have a leisurely day to enjoy the environs of our splendid hotel. We make a visit to St Ives – the Cornish seaside town has been attracting artists for decades who come to capture the area’s undeniable natural beauty. There will be time to visit both the Tate St Ives and the Barbara Hepworth Museum and Sculpture Garden. There will be plenty of time to enjoy this quaint but stylish town before dinner (included) at the hotel. 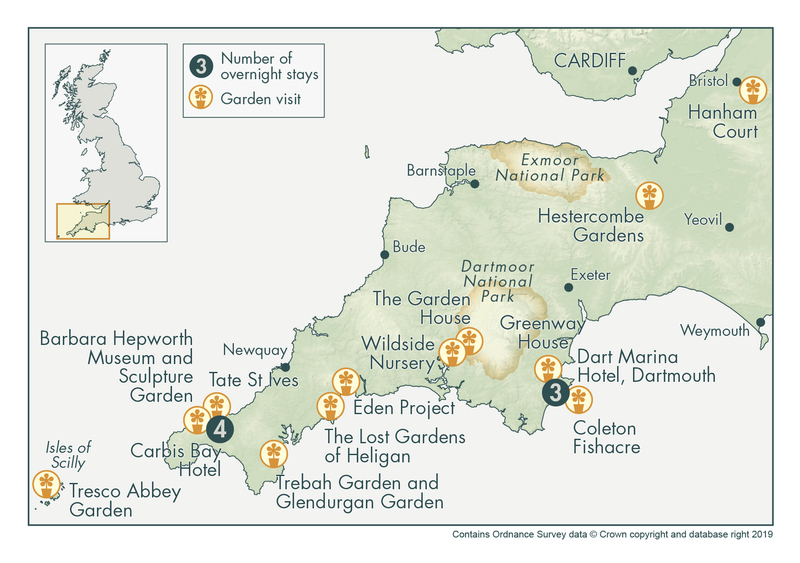 After checking out of our hotel, we travel north and our first visit of the day is to The Lost Gardens of Heligan. 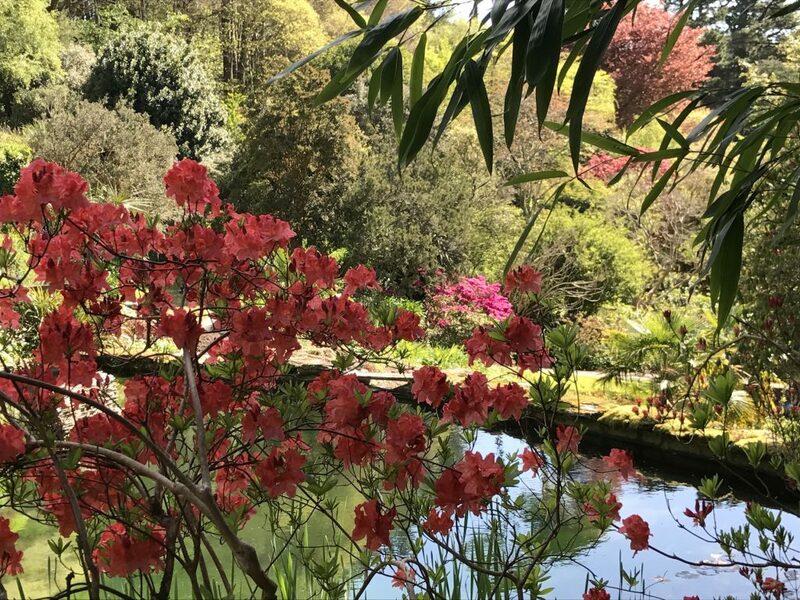 Twenty-five years ago, The Lost Gardens of Heligan were rediscovered and underwent a ground breaking restoration project. We will enjoy a guided tour of the gardens and there will be time for lunch (independent) and further exploration. After lunch we visit the Eden Project. 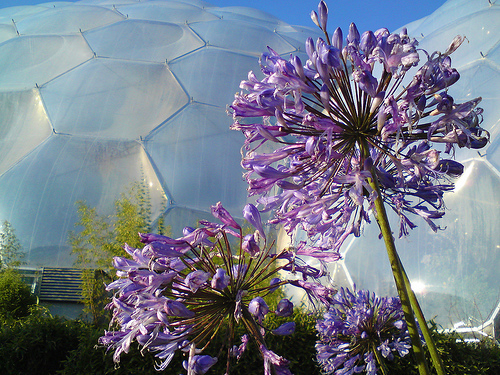 An astonishing story of regeneration, the Eden Project is nestled in a huge former china clay mine. The massive Biomes house the largest rainforest in captivity, stunning plants, exhibitions and striking contemporary gardens. We cross from Cornwall into Devon and check-in to our second base of the tour, the 4-star Dart Marina Hotel & Spa. Dinner in the hotel (included). Today, we take a private river cruise on the River Dart followed by a steam train to Greenway House, former summer home of Agatha Christie. The house is exactly as she left it and contains her eclectic collections from around the world. There is also time to stroll through the gardens. 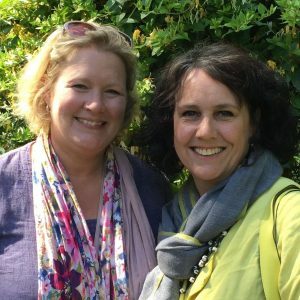 We have lunch (included) before visiting our next garden, Coleton Fishacre, a 1920s country retreat, with luxuriant gardens by the sea. We return by coach to our hotel. Your evening is at leisure with the chance to explore the charming town of Dartmouth. 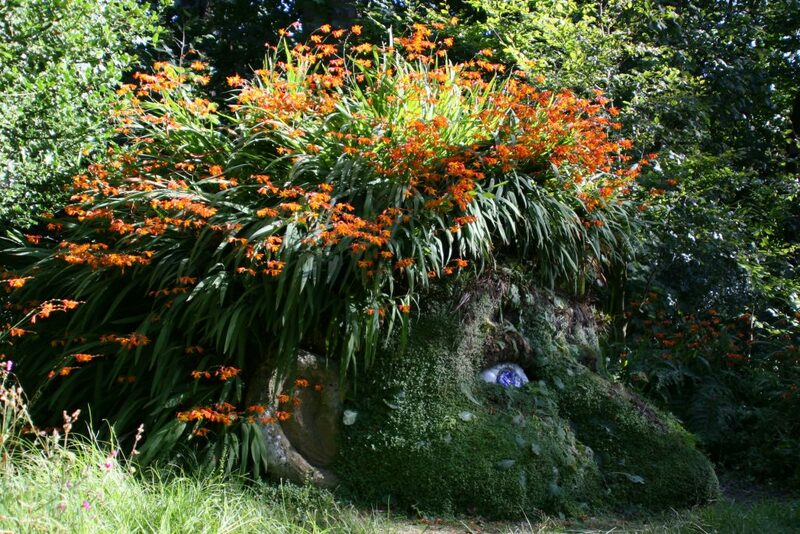 This morning, we head to Wildside Nursery & Garden – the private garden of Keith and Ros Wiley on the edge of Dartmoor. Ros is an artist and Keith was creator and head gardener at the nearby Garden House until 2003 when he decided to set up a new garden and nursery just half a mile down the road. He is a proponent of a ‘new naturalism’ movement in gardening, which seeks to work in harmony with nature, allowing plants to thrive much as they would in the wild. 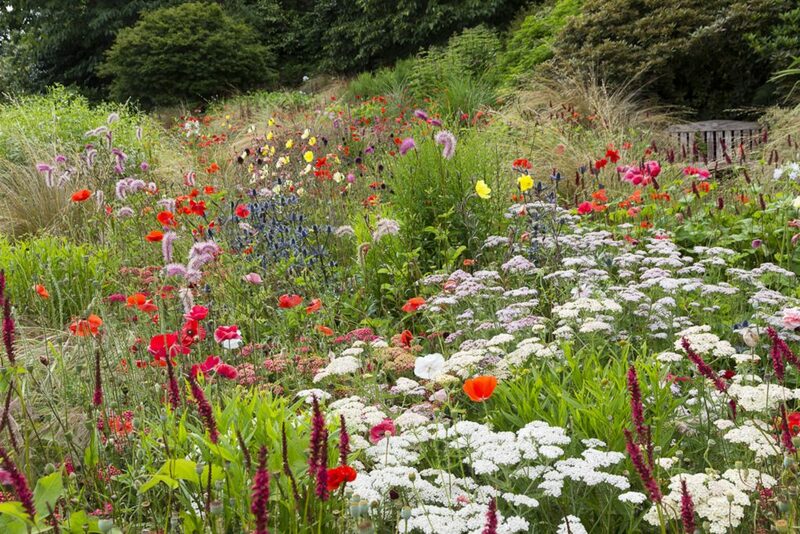 He takes inspiration from natural landscapes to create areas of planting in his gardens inspired by sights from around the world. We continue on to The Garden House. The ten acre gardens were developed in the 1940s by Lionel and Katharine Fortescue. 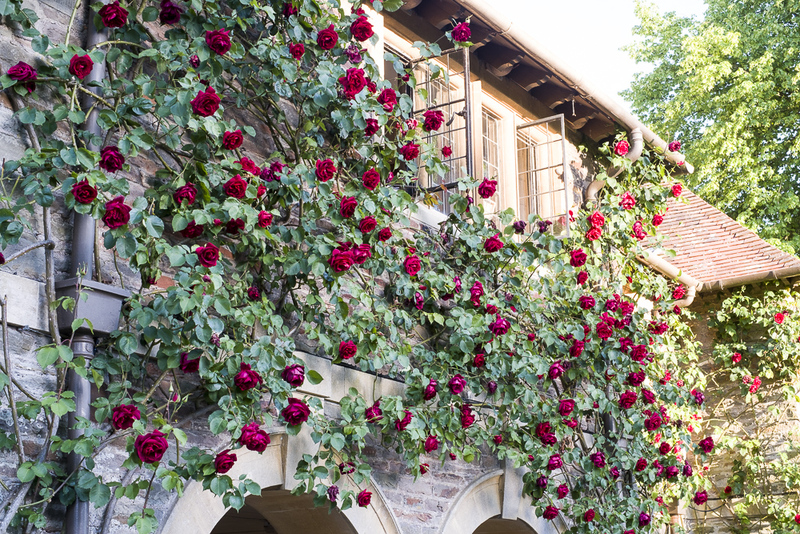 Over the next 40 years the Fortescues created a garden, further developed by curator Keith Wiley which is viewed as one of the finest in Britain. 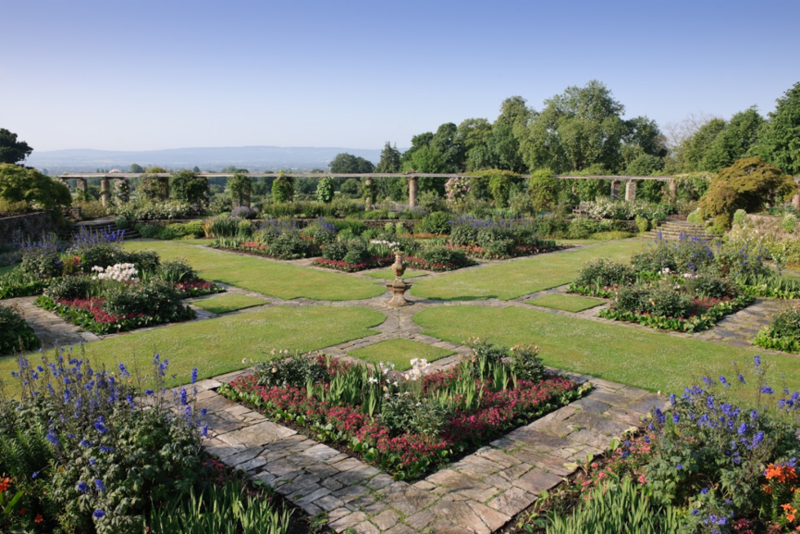 We will have a Devon cream tea lunch (included) on arrival followed by free time to explore the gardens. We return to the hotel for our final night dinner (included). We check-out in the morning and head back towards London. En-route we make a stop at Hestercombe Gardens. 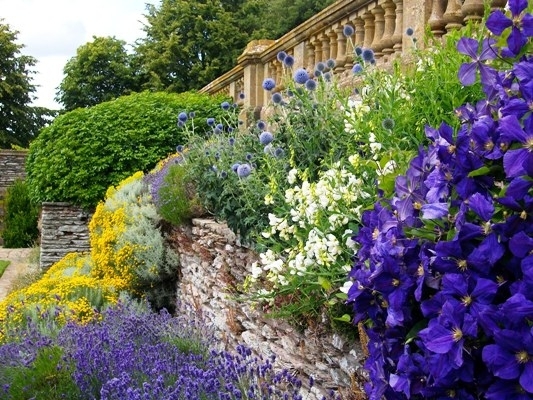 The formal Edwardian Garden has been described as ‘Lutyens at his best’. 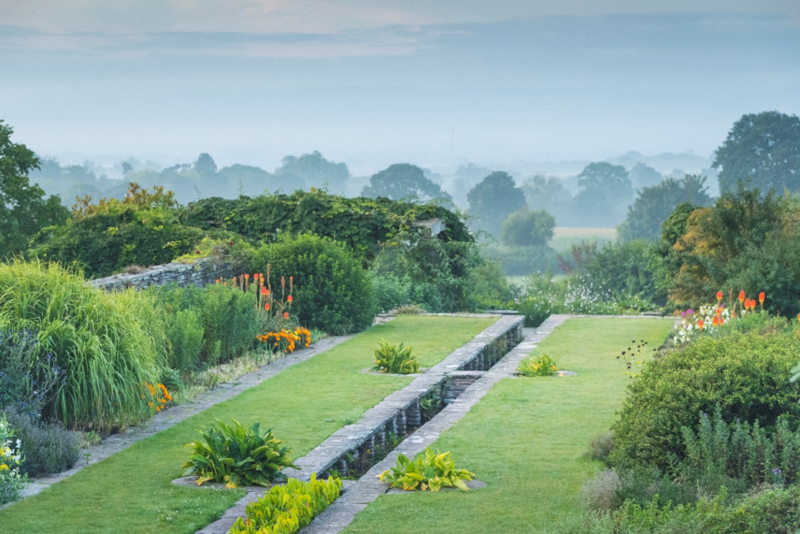 Designed just before the First World War, it contains one of the great masterpieces of the collaboration between Edwin Lutyens and Gertrude Jekyll. There will be time for lunch (independent) and exploration of the gardens. In the late afternoon we will make two coach drop-offs: one at London Heathrow airport and one in central London. Our Hotels Our hotels are 4-star and selected for their high standards of comfort and service. All rooms are en-suite and offer free wi-fi access. 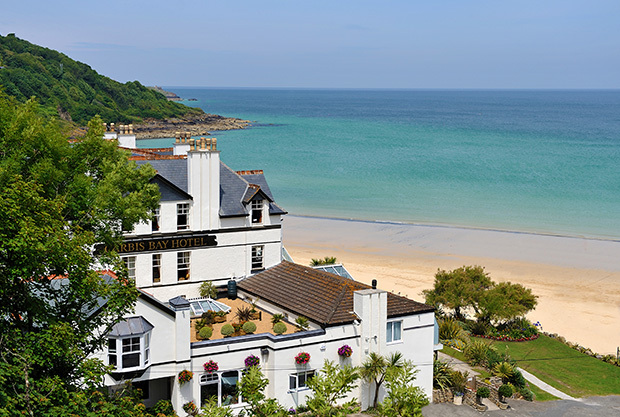 Carbis Bay Hotel & Spa, St Ives This superb coastal retreat offers access to its own 25 acre beach and breathtaking views of the beautiful Carbis Bay. There are 47 individually designed bedrooms, a luxurious spa and award-winning dining. The hotel is located on a 125 acre estate just outside the picturesque town of St Ives. All rooms have sea views. 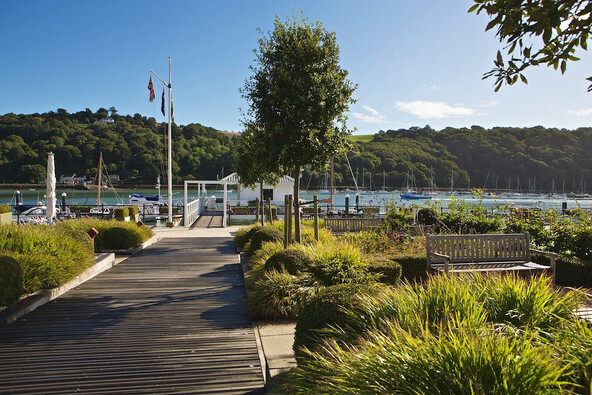 Dart Marina Hotel and Spa, Dartmouth A tastefully modernised 4-star hotel and spa, beautifully situated overlooking the River Dart and just a 10-minute riverside stroll into Dartmouth. 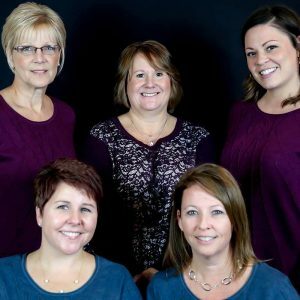 All bedrooms have lovely river views, comfortable furnishings and the restaurant is award-winning. There is a beautiful spa and indoor pool. The hotel is situated in the South Devon Area of Outstanding Natural Beauty. PRICES INCLUDE: Accommodation at 4-star hotels with en-suite facilities based on twin/double room share; buffet breakfast daily; 4 lunches & 5 dinners; admissions to gardens; deluxe coach travel with professional driver; transport to and from the Isles of Scilly; guided tours and speakers as described in an information pack provided at the start of the tour; services of your Sisley tour director throughout; arrival transfers are included only if you are joining the tour at Heathrow Airport on the first morning of the tour. PRICES EXCLUDE: Airfares (Isles of Scilly flights included); passport and/or visa fees; beverages; laundry; telephone calls; lunches and dinners (except where included in the itinerary); gratuities; souvenirs and items of a personal nature. EXCHANGE RATE INFORMATION: You can get an idea of the cost of the tour in your local currency by using a currency converter. Conversion rates are based on institutional or inter-bank daily rates. Retail conversion rates include fees and will generally differ from these rates.